Another birthday (Christmas / Easter / Anniversary etc) looming and no idea what to buy for your nearest and dearest? 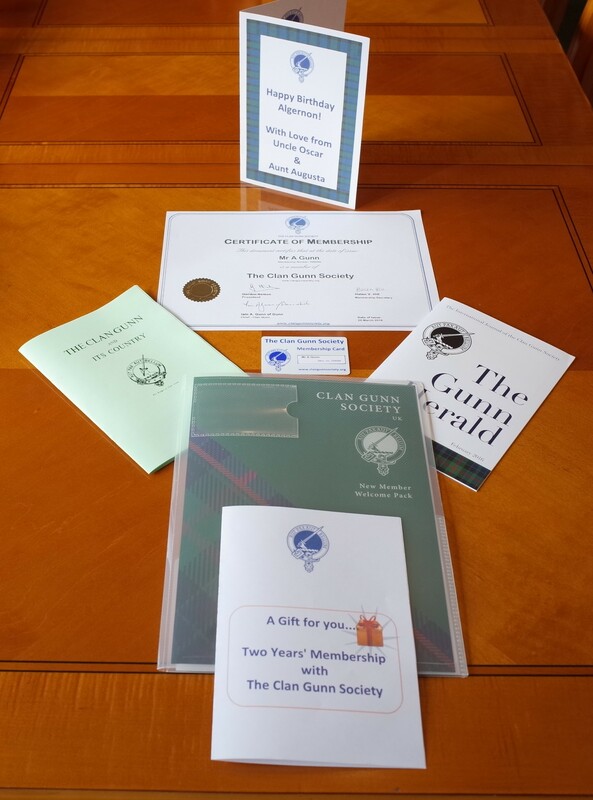 If they can claim Gunn heritage, why not put them in touch with their roots and buy them a two year membership gift pack with the Clan Gunn Society? For just £32 for UK addresses and £38 for non-UK ones, your loved one will receive a greetings card with your personal message on the front of it, along with a nicely packaged gift pack including their membership certificate and card, a copy of the latest “Gunn Herald” (our colour magazine containing many interesting and informative articles) and a booklet “The Clan Gunn and Its Country” explaining the roots and history of the Clan. For the next two years they will then enjoy the same privileges as every other member, including receiving six further copies of the “Gunn Herald”, free access to the Clan Gunn Centre at Latheron and of course the opportunity to join with the Clan for our regular celebrations throughout the year. If you would like to proceed, then please choose the appropriate option below (depending upon where your relative or friend is located) and click the “Buy Now” button; that will take you to the PayPal website. After completing the PayPal payment, you will be re-directed back to a page on this site where you can give full details of the recipient of your thoughtful generosity. Please allow up to 14 days for delivery to UK addresses and 28 days for non-UK addresses.